Blue Bird Press, 9780996048453, 408pp. Fifteenth-century Spain was a terrifying place. It was the time of the Inquisition "a time of torture, betrayal, and unexpected courage. The Muslim world was struggling to keep the West in an economic vise, the Christian world was fighting back against their control of its trade routes, and the Jews were caught in the middle "tortured if they assimilated, expelled or killed if they clung to their heritage. Into this turbulent scene step a unique combination of strong-willed characters, brought to life with stunning realism by award-winning novelist Newton Frohlich. Cristoforo Colombo, ingenious sailor and explorer with one foot in the Jewish world and one in the Christian, is determined to reach the East via the West "if only he can find a way to finance his voyage. His Christian wife, Filipa, offers him social acceptance and valuable contacts while the beautiful and talented Beatriz rekindles in him the spark of his true identity "one he (TM)s been forced to hide. The influential Santangel family, converted Christians, risk their fortunes to finance the voyage of discovery "and risk their lives when they resist the Inquisition. And the imperious Queen lsabel, who holds the power to change all of their lives, must choose at last whether to sponsor the grand scheme set before her. 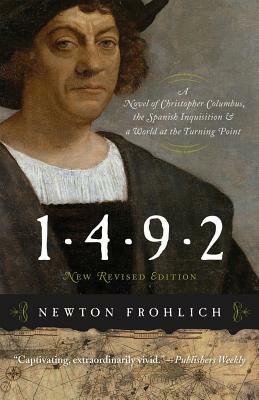 A vivid tapestry of passion and political intrigue, fanaticism and economic ambition, 1492 depicts a crucial moment in world history "with sobering parallels to today "when human tragedy and human triumph were inextricably intertwined. Newton Frohlich is the award-winning author of the historical novel The Shakespeare Mask as well as 1492: A Novel of Christopher Columbus, the Spanish Inquisition & a World at the Turning Point and Making the Best of It: A Common-Sense Guide to Negotiating a Divorce. A former lawyer, he devoted eight years to the research and writing of 1492. He has lived in Washington, D.C., the south of France, and Israel and now makes his home on Cape Cod with his wife, Martha, a musicologist.